Parbens have been shown to alter estrogen levels, heighten allergic reactions, decrease sperm count, cause problems to fetal development for pregnant women and spurs the development of skin cancer. Read more about Parabens in Lubricants. 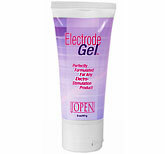 This is a non-greasy electro conductive electro gel that can be used with Electro Stimulation products such as the Intensity by Jopen. It ensures good electrical contact between the accessory and your skin which is essential in achieving the ultimate sensation. For External use only. (2oz). 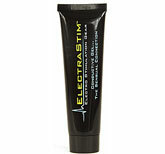 The Mystim Electrode Adhesive Gel is a paraben free electrode gel that is safe to use with any electostimulation device that requires electrostim pads (self-adhesive electrodes). It eliminates hot spots and keeps pads in place. The adhesive gel intensifies the electrostimulation to maximize the conductivity between your skin and the electrostimulation device. 1.7 oz (50 grams).